Photo: Reid Beck House, ca. 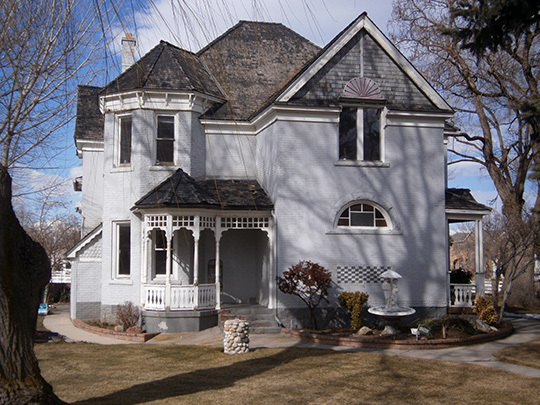 1899, 12542 S. 900 East, Draper, UT. Listed on the National Register of Historic Places in 2012. Photographed by User:Ntsimp (own work), 2013, [cc0-by-1.0 (creativecommons.org/publicdomain/zero/1.0/deed.en], via Wikimedia Commons, accessed September, 2013. The Salt Lake County Government Center is located at 2001 South State Street, Salt Lake City UT 84190; phone: 801-468-3531. Prior to Utah statehood in 1850, what are now the county and city of Salt Lake were well-developed. Salt Lake City was the capitol of the "Utah Territory" and became the seat of Utah County which was formed in 1897. In 2001 the county changed it's governing structure and is now ruled by a mayor with a 9-member County Council. Prior to the arrival of the Mormons, Shoshone, Ute, and Fremont Indians variously claimed areas of Utah for fishing, hunting and gathering. The county's primary posture of agriculture in the Brigham Young days, has given way to a new economy that finds cities and suburbs spread across much of Salt Lake County.